Lately, Google Chrome browser on Android OS has been throwing an error whenever I try to open a new webpage, “site cannot be reached, check your internet connection”. I solved this problem by going into Settings and turning Data Saver Off. Following is a step-by-step guide to creating your own CA (Certificate Authority) — and also self-signed SSL server certificates — with openssl on Linux. Self-signing is the simpler route to take, but making one’s own CA allows the signing of multiple server certificates using the same CA and involves only a few extra steps. After using openssl to generate the necessary files, you’ll need to integrate them into Apache. This process differs between Linux distros and versions of Apache. Making a homemade CA or self-signed certificate will cause the client web browser to prompt with a message whether to trust the certificate signing authority (yourself) permanently (store it in the browser), temporarily for that session, or to reject it. The message “web site certified by an unknown authority… accept?” may be a business liability for general public usage, although it’s simple enough for the client to accept the certificate permanently.Whichever route you take, you’ll save the periodic expense of paying a recognized signing authority. This is purely for name recognition — they’ve paid the major browser producers to have their CA pre-loaded into them. So if you’re on a budget, have a special need or small audience, this may be useful. You need Apache and openssl. Compiling them from source, handling dependencies, etc. is beyond the scope of this document. You can consult their documentation, or go with a mainstream Linux distro that will do the preliminary work for you.Now you need to decide whether you’ll make a CA (Certificate Authority) and sign a server certificate with it — or just self-sign a server certificate. Both procedures are detailed below. (1A) Create a self-signed certificate. Complete this section if you do NOT want to make a CA (Certificate Authority). If you want to make a CA, skip 1A entirely and go to 1B instead.Some steps in this document require privileged access, and you’ll want to limit access to the cert files to all but the root user. So you should su to root and create a working directory that only root has read/write access to (for example: mkdir certwork, chmod 600 certwork). Go to that directory. Then create a certificate signing request with it. This command will prompt for a series of things (country, state or province, etc.). Make sure that “Common Name (eg, YOUR name)” matches the registered fully qualified domain name of your box (or your IP address if you don’t have one). I also suggest not making a challenge password at this point, since it’ll just mean more typing for you. These files are quite sensitive and should be guarded for permissions very carefully. Chown them to root, if you’re not already sudo’d to root. I’ve found that you can chmod 000 them. That is, root will always retain effective 600 (read) rights on everything. Now that you’ve just completed Step 1A, skip ahead to Step 2. (1B) Generate your own CA (Certificate Authority). Complete this section if you want to make a CA (Certificate Authority) and sign a server certificate with it. The steps for making a server certificate are also included here. If you’d rather one-time self-sign a server certificate, skip this step entirely and go to 1A instead. Some steps in this document require priviledged access, and you’ll want to limit access to the cert files to all but the root user. So you should su to root and create a working directory that only root has read/write access to (for example: mkdir certwork, chmod 600 certwork). Go to that directory. In this step you’ll take the place of VeriSign, Thawte, etc. You’ll first build the CA key, then build the certificate itself. The Common Name (CN) of the CA and the Server certificates must NOT match or else a naming collision will occur and you’ll get errors later on. In this step, you’ll provide the CA entries. In a step below, you’ll provide the Server entries. In this example, I just added “CA” to the CA’s CN field, to distinguish it from the Server’s CN field. Use whatever schema you want, just make sure the CA and Server entries are not identical. If you don’t have a fully qualified domain name, you should use the IP that you’ll be using to access your SSL site for Common Name (CN). But, again, make sure that something differentiates the entry of the CA’s CN from the Server’s CN. Generate a server key and request for signing (csr). This step creates a server key, and a request that you want it signed (the .csr file) by a Certificate Authority (the one you just created in Step #1B above. )Think carefully when inputting a Common Name (CN) as you generate the .csr file below. This should match the DNS name, or the IP address you specify in your Apache configuration. If they don’t match, client browsers will get a “domain mismatch” message when going to your https web server. If you’re doing this for home use, and you don’t have a static IP or DNS name, you might not even want worry about the message (but you sure will need to worry if this is a production/public server). For example, you could match it to an internal and static IP you use behind your router, so that you’ll never get the “domain mismatch” message if you’re accessing the computer on your home LAN, but will always get that message when accessing it elsewhere. Your call — is your IP stable, do you want to repeat these steps every time your IP changes, do you have a DNS name, do you mainly use it inside your home or LAN, or outside? Sign the certificate signing request (csr) with the self-created Certificate Authority (CA) that you made earlier. The command below does a number of things. It takes your signing request (csr) and makes a one-year valid signed server certificate (crt) out of it. In doing so, we need to tell it which Certificate Authority (CA) to use, which CA key to use, and which Server key to sign. We set the serial number to 01, and output the signed key in the file named server.crt. If you do this again after people have visited your site and trusted your CA (storing it in their browser), you might want to use 02 for the next serial number, and so on. You might create some scheme to make the serial number more “official” in appearance or makeup but keep in mind that it is fully exposed to the public in their web browsers, so it offers no additional security in itself. Make a server.key which doesn’t cause Apache to prompt for a password. Here we create an insecure version of the server.key. The insecure one will be used for when Apache starts, and will not require a password with every restart of the web server. But keep in mind that while this means you don’t have to type in a password when restarting Apache (or worse — coding it somewhere in plaintext), it does mean that anyone obtaining this insecure key will be able to decrypt your transmissions. Guard it for permissions VERY carefully. (2) Copy files into position and tweak Apache. server.crt: The self-signed server certificate. server.csr: Server certificate signing request. server.key: The private server key, does not require a password when starting Apache. server.key.secure: The private server key, it does require a password when starting Apache. ca.crt: The Certificate Authority’s own certificate. ca.key: The key which the CA uses to sign server signing requests. The CA files are important to keep if you want to sign additional server certificates and preserve the same CA. You can reuse these so long as they remain secure, and haven’t expired. (1) Make your keys and copy them into position. (2) Create an SSL document root directory. Since /srv/www/htdocs is the location for HTTP, I suggest /srv/www-ssl/htdocs for SSL delivered pages. That way you might later consider a /srv/www-ssl/cgi-bin to compliment the /srv/www/cgi-bin (to mirror the architecture and make certain relative pathing easier to deal with depending on how you write applications). But that’s your call. Create some directory to serve SSL pages. The last command creates a little dummy index.html file for testing purposes. (3) Direct Apache to load the ssl module and start up with ssl capability. (4) Direct Apache to listen to the right ports. (5) Set up a virtual host conf file for the SSL port. Make sure the SSLEngine is on, and the SSLCertificateFile and SSLCertificateKeyFile point to the ssl.crt and ssl.key you created with the openssl commands. If you went with default locations in an earlier step, you shouldn’t have to make any special changes in this regard. Just before the </VirtualHost> directive is closed, add the following, making tweaks as necessary for your environment. If you don’t make a directory directive, the SSL instance won’t know where to look for the doc root. (6) Open up the ports on your firewall. Make sure that HTTP and HTTPS are enabled for the External Zone. Note that this mechanism assumes port 80 and port 443 respectively. If you want to set up HTTP or HTTPS on a different port (for instance, 8080 or 444) you need to go to the Advanced screen and manually type in the port number under “TCP Ports” and describe the protocol you’re adding (for example, HTTP or HTTPS) in the last line under “IP Protocols.” If you have a router, it probably carries additional firewall rules. You’ll need to open up the appropriate port(s) there as well. That’s beyond the scope of this document, but should be in the docs that pertain to your hardware. Done — test it out. 2. Uninstall any previous installations of Java Plugin. Only one Java Plugin can be used at a time. When you want to use a different plugin, or version of a plugin, remove the symbolic links to any other versions and create a fresh symbolic link to the new one. 4. Create a symbolic link to the Java Plugin in the Firefox plugins directory. 5. Start the Firefox browser . Type about:plugins in the Location bar to confirm that the Java Plugin is loaded. You can also click the Tools menu to confirm that Java Console is there. As of March 1st, 2010, Google has dropped support for Microsoft longest standing web browser, the IE6. Meaning that Google docs, Google Apps, Gmail and all other Google services will no longer support the ageing browser in an effort to introduce new features to these services. Firefox 3.6 has finally landed. Now you can try the latest web browser from Mozilla. The new version comes with some new features: speed, detection of outdated plugins and graphics personas. Most important feature of all is the added securities that makes it the safest browser to use. This is a note-taking add-on for Firefox that saves notes as bookmarks in Firefox. This means you get all the convenience of browser-based note-taking, and cross-browser syncing if you’re using Mozilla Weave, Xmarks, or another method to sync your bookmarks between instances of Firefox. Read it Later is an extension that works with a Web-based service. Here’s how it works. Once you install the extension, RiL adds a yellow icon to the “Awesome bar” in Firefox, and a similar icon to the toolbar next to your search. When you’re on a page you want to save for later, just click the yellow icon. Google Reader fans will also love RiL because it will also clip items from Google Reader without having to view the page first. Once the extension is installed, it adds a RiL icon to Google Reader items (right next to the star). Just click that and the entry will be added to. According to market research firm Net Applications, Internet Explorer had roughly 67 percent of the worldwide browser market in August, while the Mozilla foundation’s Firefox had 23 percent and Apple Inc’s Safari browser had 4 percent. This was true on Aug 2009. Mozilla Foundation released the latest version of the well known web browser, Firefox 3.5.2. The new version addresses several critical security vulnerabilities. Among the stability improvements, it also brings proper ICC profiles rendering. Private browsing mode is included along with open video format support already built in. *Google has also released official builds of Google Chrome for Linux and Mac OS X (see update below). If you are looking to install Chrome on a USB stick, check out Portable Google Chrome. 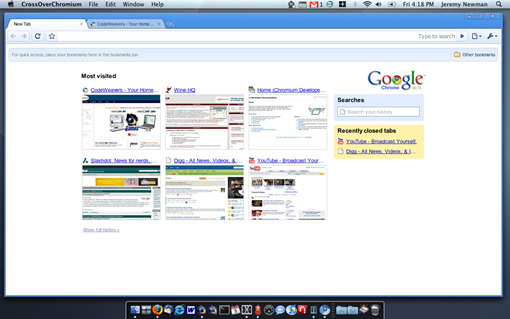 The Google Browser port, known as Crossover Chromium, is available for download on Mac OS X as a native Mac .dmg file or on Ubuntu, RedHat, Suse, etc. as standard Linux packages. Google Chrome is built with open source code from Chromium. Mac users can simply drag the Chromium .dmg file into their Applications folder. Linux users should use the appropriate tools for their respective Linux distributions to unpack the installer package. 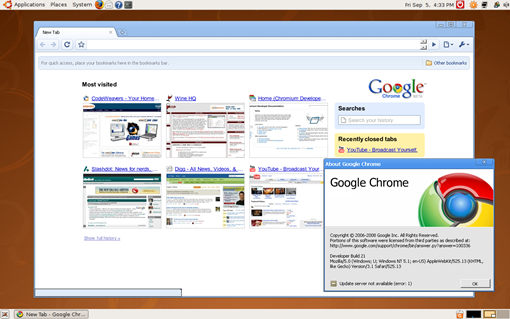 Google Chrome on Linux is available for both 32bit and 64bit versions. Update: The official builds of Google Chromium are now available for Linux and Mac here. The interface and features of Chromium for Mac OS X are similar to that of Chrome for Windows but it’s a developer release and not very stable yet. If you haven’t tried Xmarks add-on with Firefox web browser then you’re missing on a whole lot of features. If you use more than one computer, keeping bookmarks and passwords synched between the machines can be a bit of a hassle. Actually, it can be a major hassle, unless you’ve got something like Xmarks at your fingertips. Xmarks is an extension that provides the ability to sync bookmarks and passwords, backup and restore bookmarks, and provide access to your bookmarks from the Xmarks Web site. In addition, you have the ability to set up profiles, so you can separate your personal and work bookmarks if you want to. Click on the Xmarks info icon in your location bar to see detailed information about the site you are on, and discover other great sites just like it. The next time you add a bookmark, Xmarks will automatically suggest a list of bookmark tags. These suggestions are based on the tags other Xmarks users chose for the same site. Type a tag name into the Firefox 3 location bar (also known as the Awesome Bar) to quickly find sites with that tag.